Spread the LIGHT with Nice Braille – 33% donated to Prevent Blindness. Nice Braille designs say LIGHT, and light is what they spread, with 33% donated to help Prevent Blindness. 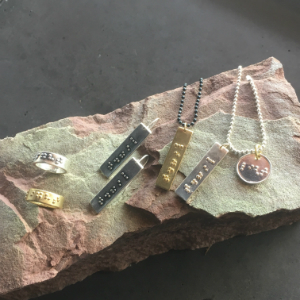 Nice Braille jewelry includes rings, pendants and earrings in round and rectangle. Choose from solid silver, golden bronze or solid silver with 22-karat gold Braille dots. Use arrows to choose design and material. Read more about Nice Braille designs in our blog post. To learn about fundraiser packs or custom Braille designs with your own secret word, legible monogram or hidden message, email Jill@aNiceWorld.com.